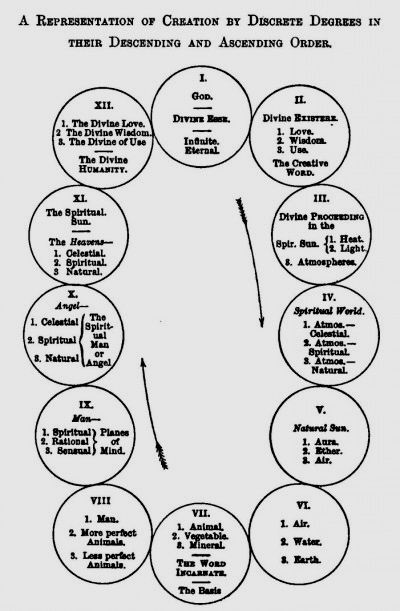 We have attempted to represent in a diagram the following steps in the creation of the world by discrete degrees in the descending order, and the return of creation to union with the Creator by the scale of uses in ascending order. Of the all-originating Being, the Divine Esse itself, nothing can be predicated but infinity and eternity. For Being pure and simple must always have been, nor can it cease to be, nor can there be a limit to it, and yet until it exists it has not become a thing to which we can assign qualities or a name. But the Divine Being not only is, but EXISTS ; it exists in having relation to that which is, or is to be, outside of itself. Its existence is in the three Divine Essentials of Love, Wisdom, and Use. These are the qualities or principles by which alone any created things may have being. But besides the Divine Being and the Divine Existence, there is also the actual going forth or Proceeding of the Divine, or the Divine in its going forth. What goes forth is the Divine Love and the Divine Wisdom and the Divine of Use, and in these essentials pure Being exists. It is because Being exists in Love, Wisdom, and Use, that it can proceed in the works of creation. Therefore of this trine of Divine ESSE, EXISTERE, and PROCEDERE, the ESSE is the Infinite and Eternal End, the EXISTERE is the Infinite and Eternal Cause, and the PROCEDERE is the Infinite and Eternal Effect : and each of these again contains within itself its corresponding degree of the Divine Essentials, the ESSE being essentially the Divine Love, the EXISTERE being essentially the Divine Wisdom, Logos or Word, the PROCEDERE being essentially the Divine Principle of Use or Work. The First Proceeding of the Divine Love and Wisdom constitutes the luminous sphere which is the sun of the spiritual world, and is the source of spiritual heat and spiritual light. " That heat and light are called spiritual because God is called a spirit, and God as a spirit is that Proceeding." And the world, which derives its whole being from this sun as the source of spiritual heat and light, is hence called the spiritual world. The Divine Principle of Use is presented in the spiritual world as the atmospheres proceeding from the spiritual sun, embodying and conveying its heat and its light, and constituting the successive heavens or expanses of the spiritual world. "Those spiritual auras and atmospheres which are nearest to the Lord as a sun are the purest ; but further away they are by degrees less and less pure. Hence it is that there are three heavens ; the inmost heaven in the purer aura, the middle heaven in an aura less pure, the lowest heaven in an aura still less pure. These auras or atmospheres, which are spiritual because they have sprung forth from the Lord as a sun, when acted upon generally present heat, and when modified molecularly present light." ---Apocalypse Explained, No. 944. From the spiritual sun itself its atmospheres proceed respectively, and in their corresponding series, the natural sun and its three atmospheres, the lowest of these embracing its three discrete degrees of air, water, and earth. In the mineral kingdom of the earth is found the extreme limit to the outgoing Divine life and force. Here it terminates, and rests in -fixed, dead, inert matter. From this there is reaction, the sense of space and time, and the possibility of thought from these, and thus a return of all nature through man to the Creator, by the ascending scale of uses. For these uses in which the ends of creation are achieved, the mineral kingdom supplies the materials, and is actuated by an endeavour to furnish forms of use, from which endeavour come the nourishing properties of the soil. The vegetable kingdom furnishes the forms of use, the animal kingdom and man the affections and the life of use. The animal kingdom, ascending through its degrees of less and more perfect animals, in man reaches again the boundary of the spiritual world, in the natural degree of the human mind, above which lie the spiritual degrees. These are opened in succession in the minds of men after death, now angels, in the spiritual world. According to the varying qualities of the ruling love, the several societies of angelic spirits are ranged in successive heavens. The highest of these is the celestial sphere, characterized by the highest human love the love to the Lord. These dwell more immediately in the effulgent brightness and warmth of the spiritual sun, and in the love of these purified, beatified, and exalted souls, the yearning of nature for a return to and a union with its Divine Creator is satisfied, and the ends of creation are accomplished. It is to God, not as formless and aimless Being, but as Person, that creation can be ascribed ; and the fact that creation exists is proof that pure Being itself exists in a Divine Person of Love, Wisdom, and Use, called in these pages the God-Man and the Lord. As it is through the Lord as the creative Word that all things were made, so it is in the Word incarnate that the Divine goes out to the extremities of His creation, and it is in the risen and glorified Word that all creation returns to and finds conjunction with its Divine Source. Therefore the Lord as the WORD is represented as the first of the descending series, and in the Divine Humanity as the last of the ascending series, not as denying to Him supreme and sole Divinity, but because through Him and in Him the absolute, eternal, and infinite Being assumes relations with the world as its Creator, Saviour, and Regenerator. But in closing, let the summary of the whole doctrine in its own majestic proportion, and as applied to the vastest and noblest conceptions of which human thought is capable, be given in the language of him to whom, under God, the world is indebted for this new system of metaphysics, which holds by either hand theology and physical science in friendly embrace, and opens the way to a truly universal and living science, of which the knowledge of earth shall be the body, and the knowledge of God the soul.
" There are three things in every created thing, as well in the greatest as in the least, namely, end, cause, and effect. There is no created thing in which these do not exist.
" The effects of all things are in the natural world.
" It follows that the universe and everything in it was created from the Lord by the sun, which has in it the end of all things.
" Creation cannot be explained so as to be apprehended unless space and time be removed from the thought.
" Remove space and time if you can, or as much as you can, and, keeping the mind in an idea abstracted from space and time, you will perceive that the greatest of space and the least of space do not differ at all. The idea of the creation of the universe, as a whole, cannot then be any other than that of the creation of any particular part of it ; and the diversity of created things will be seen to result from the infinite things which are in the God-Man, and the indefinitely many things in the sun which is the proximate proceeding from Him ; and these indefinite things will be found to be imaged in all the created universe.
" The creation of the universe, and of all things in it, cannot be said to have been effected from space to space, nor from time to time, progressively and successively, but from eternity and infinity ; not eternity of time, for this has no existence, but from eternity not of time, since this is identical with the Divine; nor from infinity of space, for this also has no existence, but from infinity not of space, which also is identical with the Divine." * D. L. W., Nos. 154-156. "These three end, cause, and effect exist in the created universe, both in its greatest and in its least parts, because they exist in God the Creator, who is the Lord from eternity; but since He is infinite, and infinite things in the Infinite are distinctly one [distincte Unum], therefore these three in Him and in His infinites are distinctly one. Hence it is that the universe which was created from His being, and which, regarded as to uses, is His image, obtained these three in all and everything belonging to it." " The universal End, which is the end of all things in creation, is that there may be an eternal conjunction of the Creator with the created universe ; and this is impossible unless there be subjects in which His Divine may be as in Himself, consequently in which it may dwell and remain; which subjects, in order that they may be His habitations and mansions, must be recipients of His love and wisdom as from themselves ; consequently they must be such as to elevate themselves to the Creator as from themselves and join themselves with Him ; without this reciprocation no conjunction can be effected." "These subjects are men, who can elevate and join themselves [to God] as from themselves. By this conjunction the Lord is present in every work created from Himself ; for every created thing is finally for the sake of man." " Wherefore the uses of all things which are created ascend by degrees from lowest things to man, and through man to God, their Creator, from whom they originate." ---D. L. W., Nos. 169, 170. * “These things, I know, transcend the ideas of thought which are in natural light, but do not transcend the ideas of thoughts in spiritual light, for in these there is nothing of space and time ; nor do they altogether transcend the ideas which are in nature, for when it is said there is no such thing as infinite space, every one assents to it from reason ; it is the same with eternity, this being the infinite of time. The expression, 'to eternity,' is comprehended from time ; but from eternity is not comprehended unlesstime be removed."D. L. W., No. 156.